Cutting this 12" Whisper White card stock gives me many cute 4" square cards per page!! Square cards are very trendy right now and look so cute... so go ahead, use that 12" scrapbook intended paper for cards! Layer the 'You Make Me Happy' sentiment over the stem in Island Indigo Ink. This Happy Watercolor stamp set has a 'fake you out' watercolor stamp! I LOVE IT!! It is supposed to not be perfect, making it perfect for me (te, he, he). It has a ombre / variegated look pre-done so it's soft and pretty (while being trendy). Tie it together and highlight the frame/window when you tie the Daffodil Delight Seam Binding Ribbon. Adhere the 'frame' with our Stampin' Dimensional Adhesive. This gives dimension and highlights the frame. 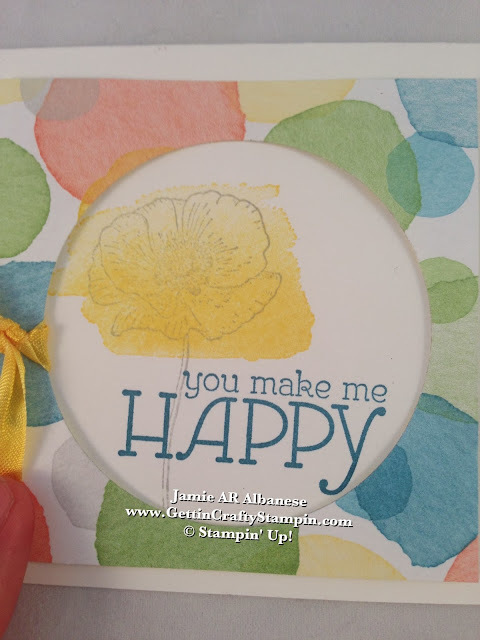 Doing the happy dance over this frame/window look, color filled, hand-stamped card! Embracing the use of color (in my card-making, paper-crafting and fashion) this card with a mock-watercolor look. So create a cute hand-stamped card and send some color to those in your life!